Cally was born and raised here at Hobbit Hill. Her mom Cassidee (Bightfox Bandit daughter) and her sire is our wonderful Benjamin Buttons. 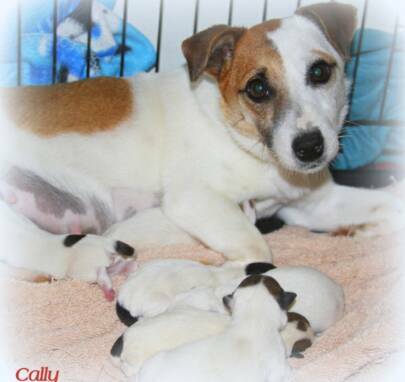 Cally has just had her first litter of puppies sired by Cowboy Buck a Roo. She is a wonderful mother and a super sweet little girl.